I am a staunch proponent of true democracy in Pakistan. I am against interference in politics from any outside agency. Whenever I discuss the shortfalls and weaknesses of our politicians, they come up with funny arguments. They try to justify their faults and misdeed by saying that our politics and democracy is not yet mature and is still passing through transitional phase. Some people may buy their argument whereas others may differ. But one thing about which I am fully convinced that our politics is not secure from outside interference. Our political paradigm is intensely influenced by foreign intelligence agencies, international media and even by governments of many foreign countries. With the demise of Gen Ziaul Haq the Army had been gradually distancing itself from politics. By the close of decade of 90’s it was becoming clear that the era of martial law was a matter of the past and seemed to be buried forever. But an inept handling of Army Chief issue by the then PM Nawaz Sharif again brought the Army into politics. However Army and the ISI have effectively kept themselves away from politics since 2008. Should we say that now our politics is free from outer interference and our politicians are at liberty to do whatever they deem good for the country? Unfortunately the answer is NO. The worst kind of interference in our domestic affairs comes from abroad. CIA/ RAW/ MOSSAD have penetrated deeply in all our state organs. Foreign agents are controlling our politics, economy, media, judiciary and bureaucracy. They are trying to make their inroads even in the armed forces. These foreign agents are heavily paid by their mentors and sponsors for their services to spoil damage and destroy Pakistan. A 4th Generation War has been effectively imposed on Pakistan over the past one decade. 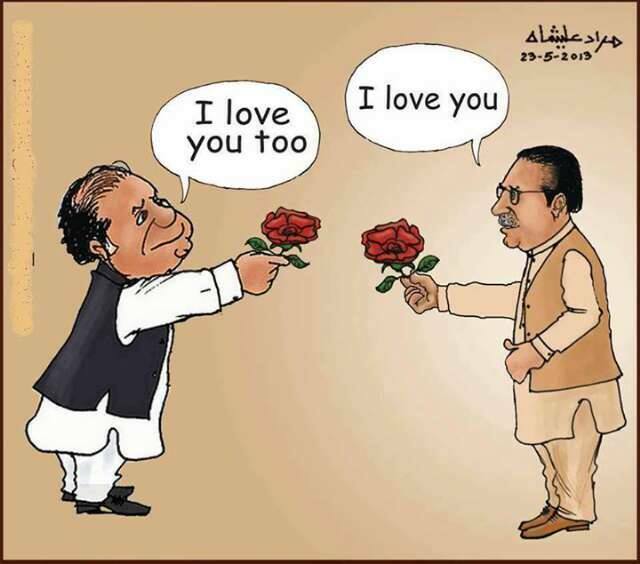 There always a hectic effort going on by the agents of our enemies to purchase, intimidate, blackmail and harass the leadership of our political parties without any discrimination so that as and when they come to power through the electoral process (which is already corrupt and flawed) they do not hesitate to bow down before the will of their masters. Some politicians give irresponsible statements in the media and pretend to be very soft on our potential enemies just to earn goodwill and ‘Shabash’ from their foreign masters. But they are not aware of the fact that how much damage they are doing to their own country. Under these circumstances there is a dire need that we should empower our ISI to keep an eye on the political activities in the country. If we keep ISI totally aloof and indifferent from what all is happening, it will be an act criminal negligence. ISI is well trained, staffed and equipped to counter the nefarious designs of our enemies. 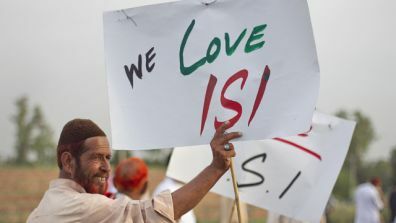 I recommend that ISI should be tasked to strictly monitor the political spectrum in Pakistan. They should watch out for any foreign interference and take immediate actions to neutralize it. ISI should look for the foreign connections of our politicians, sources of foreign funding to political parties and duel faces of political figures in which they pretend to be patriots but have linkages with anti Pakistan elements within and outside Pakistan. ISI should also take note of the anti Pakistan and anti Islam propaganda going in media and get hold of the black sheep among the journalists, NGOs and so-called human rights organizations / peace forums. This arrangement should have the backing of highest appointments of the country whereby a close cooperation / coordination among ISI, President, Prime Minister, Army Chief and Chief Justice of Pakistan is vital. In short ISI should ensure that politics in Pakistan is conducted strictly in accordance with the provisions of the Constitution. This is how we can ensure a fair and free political paradigm in Pakistan. By this arrangement I do not mean any interference of ISI in politics. There should be no make and break operations in politics by ISI on the lines of IJI etc. A level field should be provided to all politicians to present and implement their manifesto. The basic aim is to protect our political system from foreign and outside interference, which is potentially detrimental for sovereignty / integrity of Pakistan and Islamic ideology of Pakistan. This should be essentially a temporary measure till the time our politicians become mature and capable enough to shoulder their responsibilities with confidence and dexterity. When I say monitoring by ISI it does not at all mean meddling in politics. ISI will see for any foreign interferences, funds, connections, personal business interests abroad, connections with foreign agents etc. It will report to the highest forum comprising President, PM, CJP, COAS and Chief Election Commissioner. The concerned office will take action according to law. CJ can take suo moto notice, CEC can revisit the eligibility as a parliamentarian and OM can take admin action. ISI will be concerned with integrity and security of Pakistan and Islamic Ideology only. ISI will have no mandate to interfere in routine governance and issues like corruption, policy making etc. All these will be dealt with by concerned institutions like NAB etc. As FBI and CIA had been looking after the national interests of USA during cold war era, Pakistani interests can also be guarded by ISI. Paksitan is facing much more serious threat than USA was facing at that time, so all the more need for ISI monitoring. Some of my friends have suggested that people are the correct forum to carry out accountability of politicians through vote. No sir, they cannot. They are there to vote their favorite candidates only. If people had this ability the corrupt ruling mafia comprising PPP, PML-N and others would have been wiped out by now. Altaf Hussain gives statement in India that creating Pakistan was a mistake, but he is given heavy mandate at home. Maulana FuR states that struggle of Kashmiris is terrorism but he keeps getting votes, PPP knocks hell out of Sindhi haris through feudal exploitation, victimizing flood effectees and ‘dakoo raj’, but get more votes than previous elections. So accountability through ballot is a dream that may come true after 200 years. Pakistan cannot sustain this burden for a long time now, so some unconventional measures required.I feel that with the proposed arrangement Pakistan progress at a faster pace. 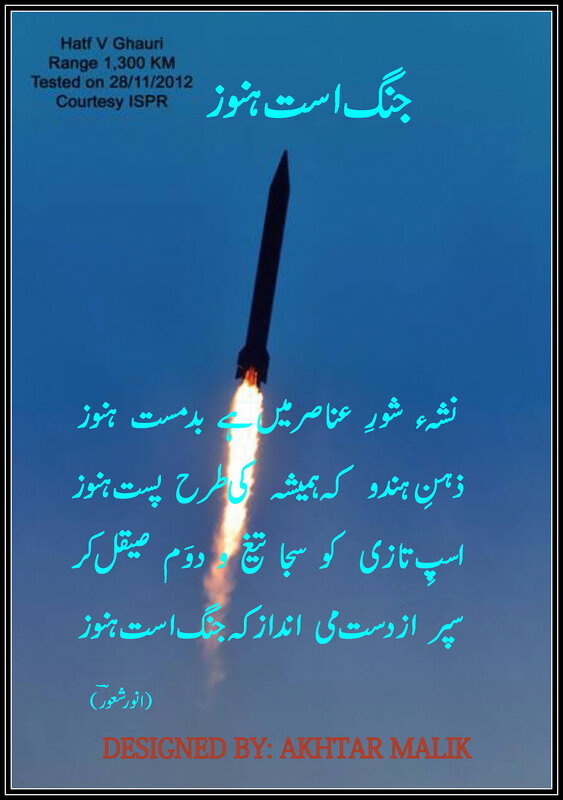 This entry was posted in Politics and tagged Foreign Interference, Inter-Services Intelligence, Pakistan, Politics on September 25, 2013 by akhterhayatmalik. 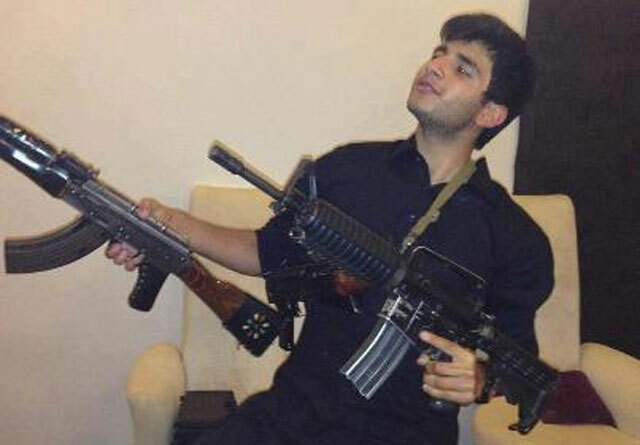 Shah Zeb was killed by son of a feudal lord / politician, Shah Rukh Jatoi in cold blood. The murderer was sentenced to death by an Anti Terrorist Court to death. The parents of the victim have forgiven the murderer reportedly under a deal. This event has jolted the whole nation who feels unsafe. There is fear that now any rich and influential murderer can go free after obtaining pardon from the family of victim, either on gun point or with the force of wealth. People are slave of this system that has lost the ability to do justice, particularly to the poor and weak segments of society. According to Quran, ‘Diyyat’ is applicable to a murder by mistake. In that case the legal heirs of the killed person can receive blood money from the murderer and excuse him. But if it is a willful murder then it cannot be condoned by paying the money. In that case the principle of ‘Qisas’ will apply which means life for a life. it is high time that our legal experts should ponder over this serious issue. If the willful murders are allowed to be condoned it will open way for the powerful and rich people to kill others and go free, either through paying the money or through pressuring the family of the victim. As a matter of fact a willful murder should be considered a crime against the state and not against the individual. this is the only way we can check the crimes. When Allah (SWT) commands that murder of one innocent person is equal to the murder of the whole humanity, then how 3,4 persons can condone the murderer of whole humanity after receiving some money? This system is not capable of dispensing justice to the poor and the weak in its present form. It protects the strong and penalizes the weak. It is totally unIslamic in its spirit. The sorry state of affairs is that a shameless murderer is being set free ‘in the name of Allah’ and ‘according to the principles of Shariah’. Allah has ordered that anyone who kills an innocent person in cold blood, it is the duty of Muslims to enforce ‘Qisas’ ie life for life, and there is life for you in Qisas if you think deeply. Note that taking life of a willful murderer is ‘Farz’ on Muslims, it cannot be left at the discretion of people. 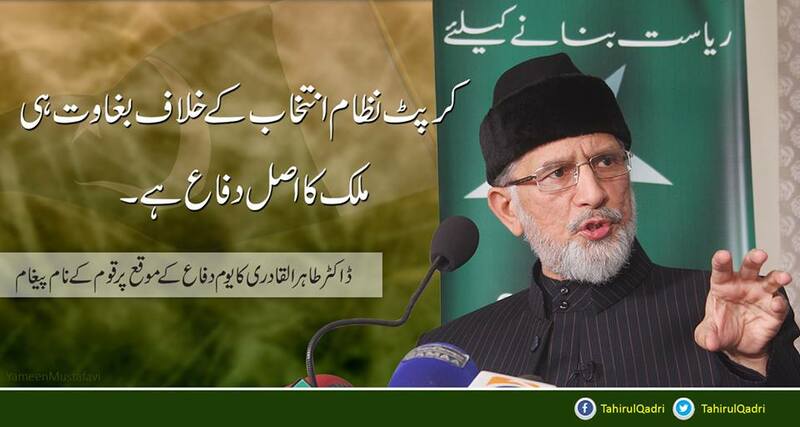 The reason is that if Qisas is not enforced then there will be ‘Fasad’ on earth. No authority can dare to contradict with the explicit command of Allah on any pretext. Our Islamic scholars and legal experts should sit together and take a review of this situation, so that peace and justice can prevail on earth. This entry was posted in Islam and tagged Diyya, Qisas, Shahzeb, Sharia on September 12, 2013 by akhterhayatmalik. 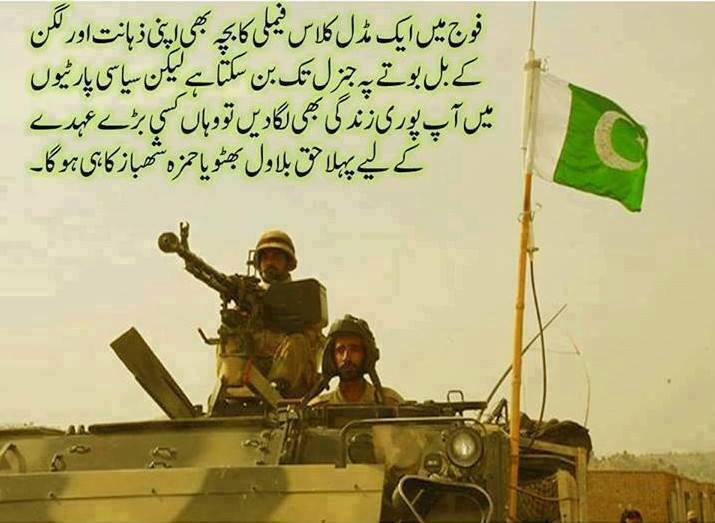 Politicians do not get tired of criticizing Pakistan Army. They should at least emulate the leadership and hierarchy system in vogue in Army. Politicians have turned their parties into ‘Private Limited Companies’ and have made their politics as ‘business empires’. This is against the spirit of democracy and is a big hurdle in smooth development / progression of civilian political paradigm. In all Western democracies there is never a monopoly of one family on a political party. This is the reason why two-party system is successful there and is a symbol of failure in Pakistan.. This entry was posted in Politics and tagged Democracy, Family Politics, Pakistan Army, Politics on September 12, 2013 by akhterhayatmalik. Every body is free to have love affair with a person one likes, but it should not be at the cost of national interests. Zardari and NS are at liberty to enter into family friendship, marriage relationships, business partnerships etc but it should be done within the parameters of their private social lives. If so, we will not have even an iota of objection. But when politics is mixed with personal interests the result is always a devastation for the country and nation. Closing one’s eyes and turning a deaf ear to the corrupt practices and bad deeds of the other, tantamount to becoming a party to those misdeeds. We have been saying time and again that all the political parties of status quo are the custodians and protectors of the existing corrupt and inept system. No improvement or innovation of any sort is expected from these parties. Time is proving the correctness of our stance with every passing day. This entry was posted in Politics and tagged Asif Ali Zardari, Corrupt practices, National interest, Nawaz Sharf on September 8, 2013 by akhterhayatmalik.